This is the seventh stadium on my tour and it is the first where I encountered tailgaters. It was an absolutely gorgeous night for baseball and the one word that I found written in my notes for the day over and over again was “fun”. I had such an amazing time at Turner Field that I didn't want to leave. I have been arriving to each of the stadiums well before first pitch and have always found myself among the first people at the park. This was not the case at Turner Field. I left my hotel early to combat the treacherous Atlanta traffic and arrived at the stadium around 4 PM. To my surprise there were fans lined up in several parking lots tailgating and having a good time without me. As I am writing this post I just smiled as I remembered the energy that permeated the lots surrounding Turner Field. I walked around the stadium stopping to chat with different groups of tailgaters. Some folks arrived as early as 1:30 PM and were cooking, drinking and talking baseball with each other. Atlanta fans have a reason to be excited, but unlike the Braves teams of the '90s who couldn't fill the stadium despite winning the division year after year, these fans are actually showing up. As I continued to tailgate hop from group to group I met with four young Braves fans (pictured right). I spoke to them for the podcast. It was great seeing teenagers and young 20-somethings coming out to the ballpark. Turner Field has had the widest array of ages I have seen thus far. There were quite a lot of young people at the game, but as you will find out later, there were also some folks who were around to see Ty Cobb pick up a bat and Walter Johnson strike him out. After hanging out with the tailgaters I headed into the park to look around. The first place I checked out was the Braves Museum and Hall of Fame. Inside there is quite a lot of history to take in, including exhibits dating back to the Boston Red Stockings through the Boston Braves, Milwaukee Braves and now the Atlanta Braves. The coolest part of the museum however is the replica train that sits amongst the memorabilia. I walked inside the train and felt what it was like for the old timers to ride the rails to get to the next ballpark. I had initially thought about doing this tour exclusively riding the train. When I think about the game of baseball I often picture arriving to the game via the railroad. Unfortunately I was not able to create a schedule that would work so I am stuck in a car. The museum did cost $2 to get in (paid for with a Braves token), but it was absolutely worth it. When I come back to Atlanta some day I plan on spending a little more time exploring the exhibits inside. After the museum there was still so much more fun to be had before the game could get under way. As I left the museum I heard the rhythmic beating of a drum line forming. I followed the beat to find that a dance party had broken out near one of the entrance gates. There was music, dancing and Homer, the Braves mascot, entertaining the crowd. For a simple regular season game the Braves organization puts on one hell of a show. One of my favorite amenities at Turner Field are the large fans that spray a refreshing mist onto you. It can get pretty hot down in Atlanta during the summer months and nothing feels better than walking through these Cool Zones located all around the park. 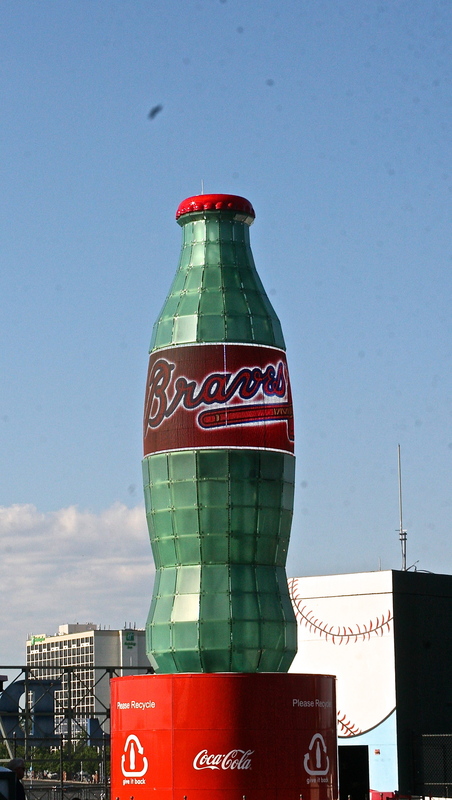 At the top of the stadium (next to the oversized coke bottle) is yet another cool attraction that makes Turner Field special. There is an area where you can walk on genuine warning track dirt and run the 90 feet from home plate to first base just like a big leaguer. It is such a simple idea, yet thus far no other park has thought to include it. Standing on top of the stadium looking down either at the field on one side or at the Atlanta skyline on the other while standing on home plate is quite exhilarating. I was having so much fun that I almost forgot to enjoy my pregame meal. I am glad that I remembered because the burger I found was sublime. There was a stand called H&F Burger that according to the fans at the stadium, sold the best burger in the country. It seemed simple enough, but when I bit into this double patty burger my tastebuds audibly thanked me. As if the tailgating, museum, burger and dance party wasn't enough, there was still a baseball game to be played. Sadly, the Braves offense never got going during the game as Madison Bumgarner of the San Francisco Giants took a no-hitter through five innings before giving up a single to lead off the sixth. The Braves were only able to muster up the strength to get three hits off of Giants pitching. The game was still a ton of fun. Giants left fielder Gregor Blanco took the fourth pitch Kris Medlen through and promptly launched it 421 feet into the right field bleachers. For the Braves, it was all downhill fom there. Earlier in this post I mentioned the wide array of ages represented inside the stadium. I met a woman who was attending her first game at Turner Field at the age of 89. She had been watching the Braves on TV for the past 40 years but had never made it out to the ballpark. Her great-granddaughter finally brought her to Turner Field to watch her beloved Braves in person. Not to be outdone, during the game there was a woman shown on the scoreboard holding a sign of her own that read “I'm 100 today”. The crowd erupted in applause as she smiled at the camera. The ovation lasted quite a while and amidst the excitement I looked to my right and saw a young Braves fan awake from her slumber. This is why I love baseball. Where else do you find infants and centenarians enjoying the same experience? I am running out of superlatives to use for what the Braves organization has created at Turner Field, but the experience at the stadium truly is spectacular.